14k rose gold filled earhook 15.2*0.51mm, sold by 4 pieces. 14k rose gold filled round ear studs of 4mm, each one with a jump ring; sold by two. 14k rose gold filled round ear studs of 5mm, each one with a jump ring. Sold by two. 14k rose gold filled simple earwires of 20mm, 0.8mm thick; sold by two. 14k rose gold filled simple earwires of 12mm, 0.7mm thick. Sold by two. 14k rose gold filled ear wires 34mm, sold by 2 pieces. 14k rose gold filled earwires of 17x20mm, sold by two. 14k rose gold filled earwires of 11.5x20mm, ended with a ball. Sold by two. 14k rose gold filled earhook 14x18mm, sold by two. 14k rose gold filled earwires of 20mm, 0.8mm thick; sold by two. Ear hooks, with "ring", in pink 14kt gold filled, 7.5 * 19mm, sold in packs of 4 pieces, or 2 pairs, to customize according to your desires, it will be enough to add pearls, or stones. 14k rose gold filled hoop earrings of 15mm, 0.7mm thick, sold by two. 14k rose gold filled hoop earrings of 20mm, 0.7mm thick, sold by two. 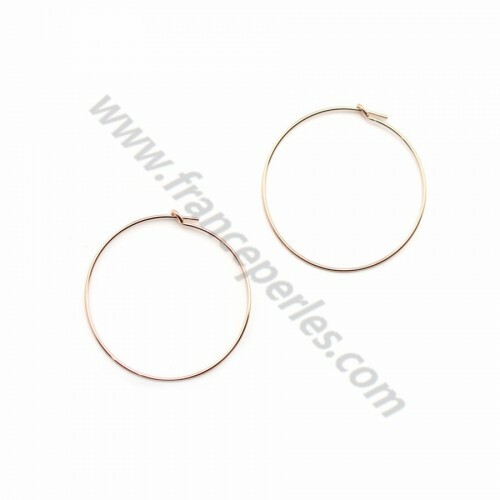 14k rose gold filled hoop earrings of 30mm, 0.7mm thick, sold by two. Creoles in 14k pinked gold filled to decorate, 20mm in diameter, and 1.25mm thick wire, sold by a bag of 2 pieces, which corresponds to a pair, to customize to your every wish, it will be enough to add pearls, or stones. Creoles in 14k pinked gold filled to decorate, 30mm in diameter, and 1.25mm thick wire, sold by a bag of 2 pieces, which corresponds to a pair, to customize to your every wish, it will be enough to add pearls, or stones. 14k rose gold filled simple keeper earrings of 15mm, sold by two. Earring in size of 8*16*0.51mm, 14K rose gold-filled, sold by 4 pieces. 14k rose gold filled Earthread, 80mm long, 0.76mm thick; sold by two.